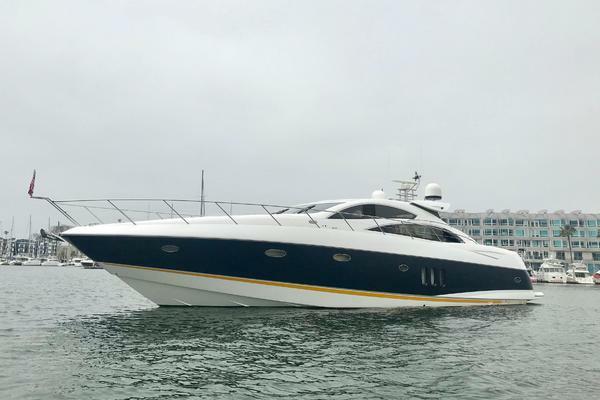 This 2014 Sunseeker 68' Predator is a one of a kind. Fit with big MTU power and Arneson drives, this custom painted, fresh water Predator is a beautiful Sunseeker. In today's market you cannot find anything nicer that isn't new. In fact, this Predator is nicer that most new boats! Breathtaking in every sense of the word, nothing signals your arrival like the Predator 68. Piercing through waves with ease, its exhilarating performance is matched only by its unmistakable styling. Exquisite interior options and captivating design are prominent throughout the entire yacht - a classic example of Sunseeker design ingenuity. The extravagant sliding roof adds a sense of occasion to every journey – especially those undertaken at a top speed of 44 knots. Built to both thrill and inspire, you can’t help but fall for this symbol of success. Simrad IS40 speed/depth Instrument with Airmar B744V depth/speed/temperature transducer and Simrad BSM module Simrad AC12 Autopilot system with iS40 pilot display and pilot keypad. Two 15" Hatteland X-Series displays. Two Simrad NSO processors. Simrad GS15 GPS & Simrad OP40 Controller. Simrad TX-06S 6kW 4 foot open array radar scanner Simrad RS82 VHF Radio with DSC function. Simrad AIS Module. Simrad GS15 GPS antenna and AIS VHF antenna.